Here’s another smart solution from Suncast, an outdoor patio storage cabinet wrapped in a delightful resin design, destined to complement any patio with elegant style whilst protectively serving accessories. The nature of Suncast’s quality resin manufacture replaces hassles associated with upkeep duties regarding servicing rotting wood and rusting metal with a simple wash down when the grime appears, within minutes a spotless appearance shines back through. If considerations are to move into the resin world due to time restraints, this is a path we strolled down too. I have to say there’s some fashion-forward thinking designs entering onto the market lately. A prime example represents this Suncast model. 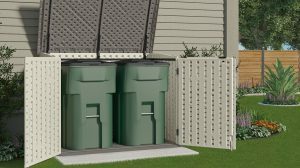 Initially we were worried whether resin would suffice weather conditions however our attentions soon swayed when we considered how the plastic wheelie bins replaced the old rusty metal variety, it’s something we all accept as common place nowadays. The fact is, resin resists weather attack. 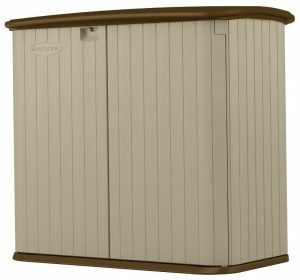 Designed into a sublime vanilla shade facade with chocolate top and lower trim provide the subtle colours to stylishly enhance any patio. 4ft 8″ width, 2ft 7″ depth and 4ft 2″ height equate to 32 cu. 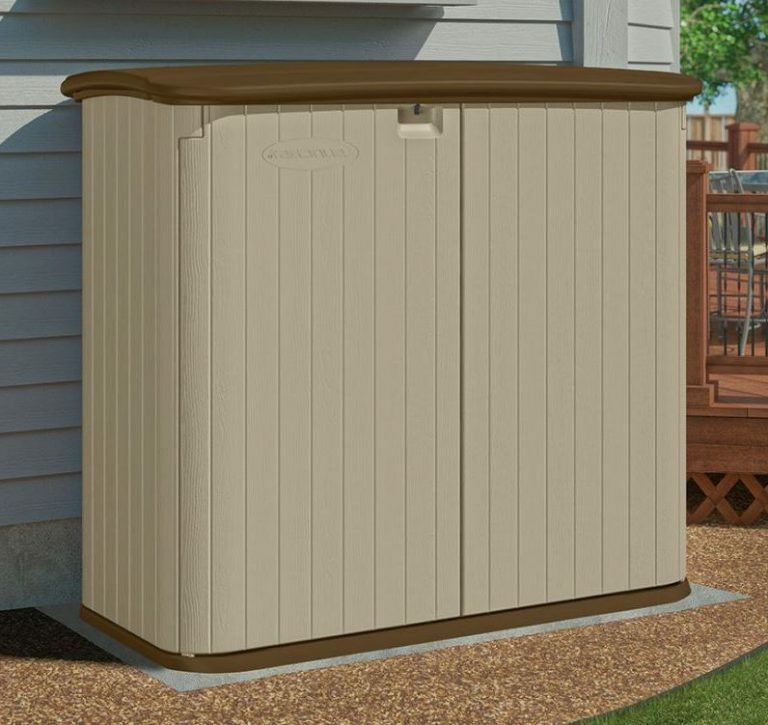 ft. of storage capacity, destined to harbor and preserve those patio and gardening essentials. Storage Space: 34 cu. ft. This Sucast cabinet delivers a smart composition entirely wrapped in resin where the floor walls and lid adjoin providing total enclosure to the outside environment. The weather-resistant make-up replaces upkeep duties with an effortless wash down whilst the waterproof manufacture results in high calibre preservation of storage. Assembly is very straightforward, efficient and quick due to the panels interlocking and securing with minimal screws whilst the manufacture is a dual skinned composition adding stability to the overall sturdy construction. Triple door access makes entry a breeze whilst the lid is able to stay open using the integrated prop-rod. Included shelf supports with dimensions for cutting your own wood shelf are presented in the instructions. Inside this dry interior presents the integral floor, purposely toughened to cope with storing weighty items if wishing to accommodate heavy gardening equipment for instance. Reviews flow through receiving impeccable feedback, purchasers adore the advantages written above super favourably. The modish style presents an attractive addition to any surroundings. 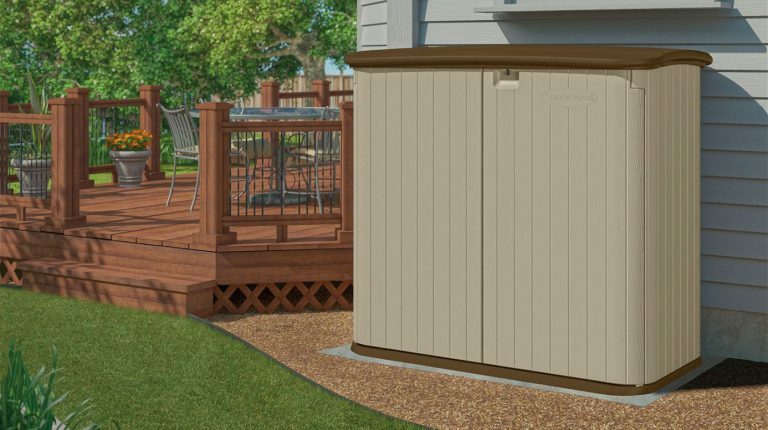 Serving duties are divided between accommodating patio accessories and gardening equipment however reading through reviews where this cabinet has been exposed to harsh weather whilst storing patio seating cushions, purchasers are delighted with the delivery of a dry internal environment. 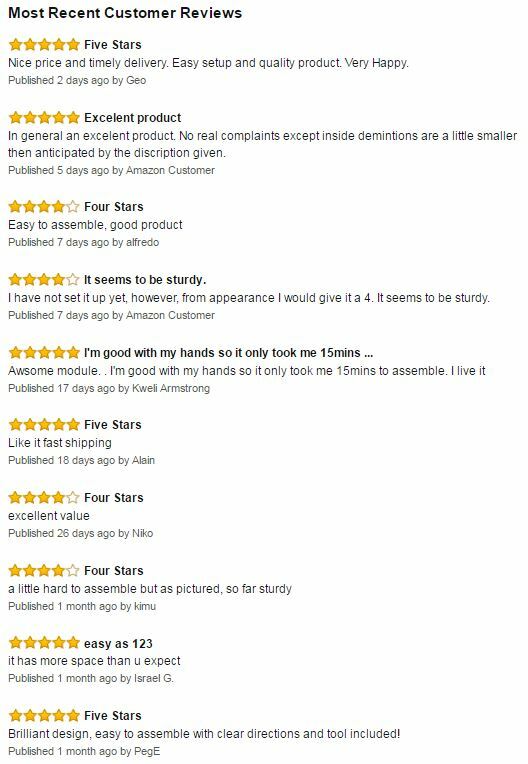 Assembly really is a cinch, feedback results in a finalised construction time taking 15-30 minutes. A few wish a shelf was included yet the instructions are very straightforward to cut your own as shelf supports are inclusive resulting in no downgrades for the absence. Solid level foundations are advised for the shed to be situated making it perfect for patios and small garden spaces. Whilst it’s usually recommended to anchor down into the foundations, Suncast don’t advise, rather suggesting to add some weighty object inside if worried about wild weather. However, this low height unit will usually sit in a sheltered spot like against a house wall or nestling below a 6 ft fenceline. 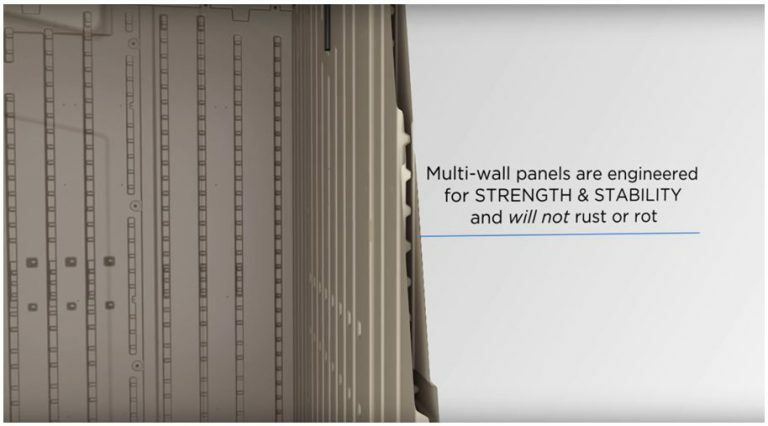 Blow molded technology is Suncast’s manufacturing technique where the resin is formed into a dual walled construction providing enhanced stability to where single walled alternatives are concerned. A subtle vanilla tint is added to the mix whilst molded to represent slim lined wood panelling on the exterior accompanied by a textured grain pattern running through, producing an admirable wooden-effect finish. The resin make-up is unsusceptible to rainwater, resists weather decay when exposed to the outside elements whilst the surface is easily cleaned with mild detergent and warm water. Many just lightly spray them down in among watering the plants on an evening, a two minutes job. 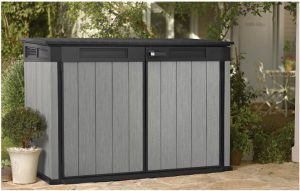 Triple way access is delivered with this Suncast Patio Cabinet. The twin doors open the entire width of the unit whilst the lid exposes entrance across the top, having the ability to stay ajar by virtue of using the prop-rod. The doors are kept closed when the lid is shut requiring to lift the lid slightly to open them. Both doors are robust containing hinge pins for opening whilst the lid consists of resin hinges that simply snap into place during assembly. The lid is manufactured using the same blow molded double skinned technique the walls possess whilst designed with a chocolate shade providing a pretty two-tone colour display with the vanilla facade. The resin manufacture provides the advantage regarding the deterioration wooden lids succumb to when exposed to the weather elements, resisting rotting, wood-worm attacks and other pest infestations. The waterproof topping nicely extends beyond the doors and facade whilst designed with a slight angle preventing water puddling and seeping in at the top of the walls. This cabinet provides triple door security where a clasp designed for a padlock joins and secures both the doors and lid simultaneously. Padlock not included. Inside, the floor adjoins the walls presenting a true built-in feature preventing outside debris wafting inside resulting in a clean internal environment, ideal for storing more delicate items like patio seating cushions and accessories which this unit represents a popular service for. The floor is strengthened through the manufacturing process into a thickset resin bed making it ideal for storing weighty items like small lawnmowers, garden equipment and the likes of gas containers etc. Other popular services are BBQ equipment, lawn supplies and a super haven for kids toys. Measure your storage equipment and ideas with the internal dimensions presented below. Maintenance couldn’t get any easier. Some prefer a quick light hose down when the facade becomes dirty whilst others get a bucket of warm soapy water and use a soft brush to clean. With regards to our plastic shed, whenever we’re subject to ingrained dirt we add some white vinegar into a bucket of hot soapy water and remove with a soft brush. Many other mild cleaning detergents will accomplish the same results, this is just a tip we picked up. Unlike a wooden facility there’s no yearly rotting issues to service, no repainting and no re-varnishing whilst the beauty regarding a resin lid, they requires no future re-roofing jobs either making summer living hassle-free. Assembly couldn’t get anymore straightforward for a cabinet this size. 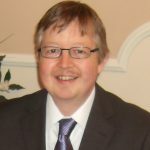 Suncast have developed their unique assembly procedure called Easy Bolt Technology. You are provided with an Easy Bolt Driver tool, it’s like a screwdriver with an allen-key head. Six resin screws are all that’s included to assemble, it’s a cleverly designed construction. You start by interlocking the wall sheets into the base and screwing into place, then follow the clear instructions step by step procedure to install the doors and lid and you’re done – 15-30 minutes is the average time it takes to assemble. Included with this cabinet are shelf supports for installing one shelf. Measurements and diagram for fitting a wood shelf are provided in the instructions. Usually a shed this size sits in a sheltered space like against a wall or below a fence however all Suncast recommend is you place a heavy object inside to provide more stability if it’s situated in an exposed place and you’re worried about wild weather. Competition is starting to gain traction regarding horizontal sheds. Many wish for the likes of a low maintenance resin construction yet wish to sidestep large assembly projects walk-in sheds entail. 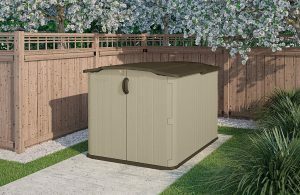 Horizontal sheds represent a way round planning laws regarding erecting large sheds in home gardens for many districts, the popular alternative is a few unobtrusive low height sheds storing a variety of outdoor gear and gardening equipment. This fashion-forward thinking design amalgamates low maintenance, stylish looks, subtle colours and weather-resistance with an easy to clean surface, destined to compliment any home-yard space with attraction. 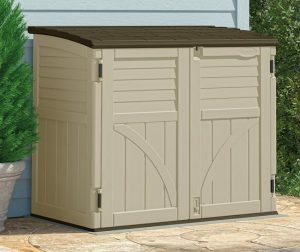 The most straightforward fast assembly results in a sturdy construction that’s waterproof and resistant to rot, a huge problem wooden sheds are prone to. 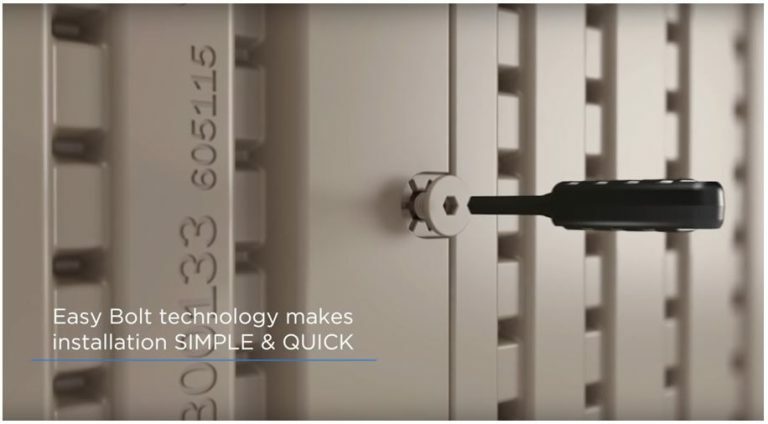 Receiving superb feedback through reviews, it’s another smart storage solution from Suncast. 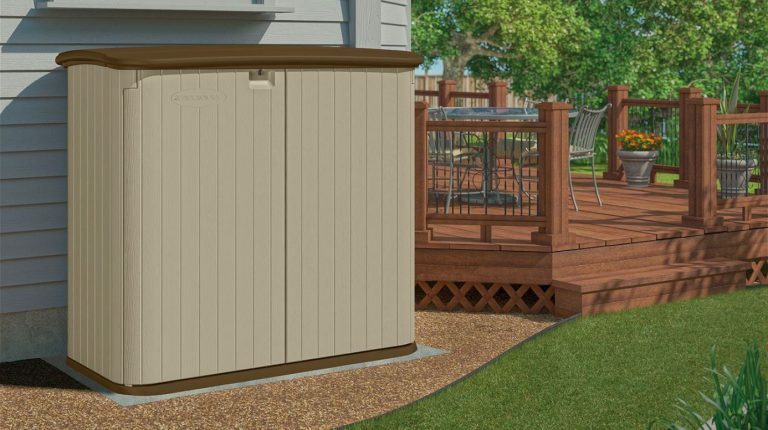 Thanks for reading this Suncast Patio Shed review. Any questions, Im always happy to help. Please drop them in the comment section below. Oh my goodness I’m so pleased I stumbled across this site! 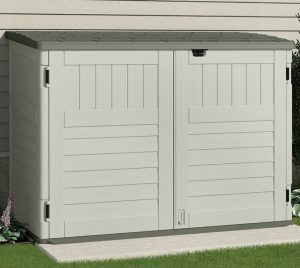 We don’t have the space in our yard for a full size shed and have been wanting to find something that would fit up the side of our house. I was worried about the plastic style in the weather but now I see I don’t need to be concerned about that at all. Do you know if these can be purchased in Australia? 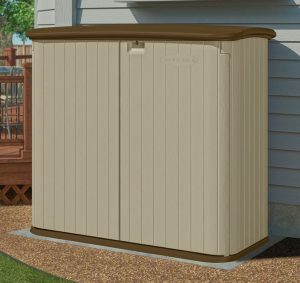 The beauty regarding this size shed is that is fits in tight spaces, sits below a standard 6ft fenceline and has an unobtrusive stance due to its low height. This type of horizontal shape is becoming more popular nowadays, in certain areas panning laws are required to construct a walk-in size which puts people off somewhat plus many prefer an easy assembly, this shed certainly delivers this. These are just a few of the reasons why they are becoming more popular. Then we have the resin structure which resists weather decay, a problem wood sheds are prone to whereas metal can rust plus they have a tendency to sweat inside in hot climates. Resin on the other hand only requires a wash down when dirty to bring it back looking new again, hence the huge interest. I only concentrate on the UK and USA market presently, so not sure whether they have Suncast sheds or not in Australia. I have just visited eBay Australia and noticed a few Suncast vertical resin units so maybe a good idea to keep having a look there, hopefully one may turn up. I am finding eBay in the UK and USA very popular for where sheds are concerned so this could be the place for you.